I read the article, and there was really nothing in it that could be debated. From the unexpected, sudden lowering of tensions along the North Korean-South Korean border, the two leaders meeting and shaking hands, and the prospect of real peace along that border, and maybe even reunification of the country–maybe even an end to one of the most brutal dictatorships ever seen on earth–the author observes that millions of Koreans have been praying and fasting and that this will result in North Korea allowing the free practice of Christianity. Snopes, the left-wing hacks who used to be fact-checkers, calls the story “fake news.” Snopes also misrepresents the article: the article does not claim that this is already happening. I guess it’s “fake news” because Snopes doesn’t want it to be true. Again, no evidence is offered, except maybe the power of prayer, and certainly the power of God’s hand over the nations of the earth. As Christians we know that faith is “the evidence of things not seen, the substance of things hoped for” (Hebrews 11:1). Pious Koreans have been earnestly praying for their country for a long time. I pray that God has heard them and will grant their prayers. 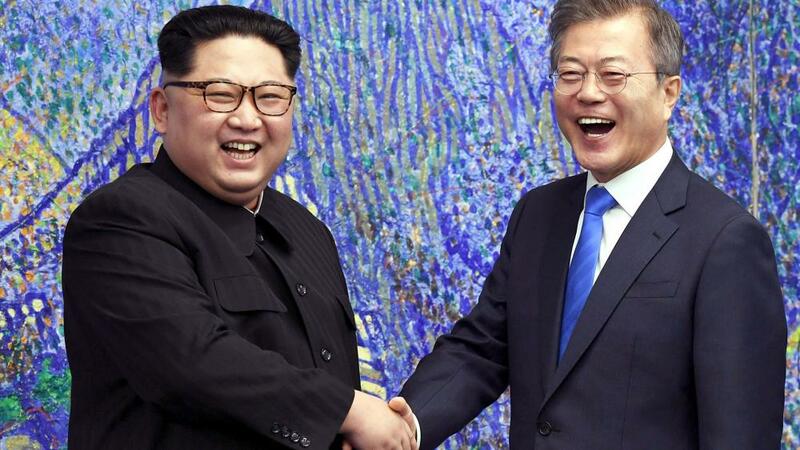 This entry was posted on Wednesday, May 9th, 2018 at 10:48 am	and tagged with Charisma Magazine, Christians in Korea, Kim family as gods, Kim Jong Un, Korean peace prospects, Korean peace talks, North Korea Juche religion, North Korea to allow Christianity, reunification of Korea and posted in news, religion. You can follow any responses to this entry through the RSS 2.0 feed. I’ve been watching this, and some other developments with great interest. Saudi Arabia seems to be opening up greatly and there’s talk of allowing Christian churches to be built there. North Korea has changed its rhetoric drastically and seems to be moving towards rejoining the mainstream instead of being a rogue nation. Iran is facing nearly non-stop demonstrations calling for an end to the imposition of religious law there by a handful of religious leaders whom have held power since the late ’70s. I certainly hope that all of these developments are sincere and have a lasting effect. God’s overall purposes are developing apace, with or without human participation, but apparently many humans want to be a part of God’s purposes. I have heard tell of Christians functioning underground in North Korea, China and much of the Middle East. Apparently there are many covert Christians in the Middle East, unable to publicize their stance because of severe persecution. It’s also good to point out that the Korean people were quick to accept Christianity and very enthusiastic in their worship. The partitioning of Korea, at the end of WW II probably stranded a lot of these Christians, so the developments mentioned in the article are likely to have a profound impact. I wish them the best. Apparently these prisoners are in better health than the poor soul who came back brain=dead after such abuse by North Korea. So let’s pray North Korea chooses wisely. I am praying too; similar to this news though tangent is the happy and confirmed news that NK released 3 US jailed pastors/missionaries! So far, by what is happening, it would seem that Kim Jung Un has been miraculously saved (like all believers have because it is by grace). That would seem plausible with such a strong change of attitude on his part. But then again, Kim may just have run out of money and needs to humble himself while he plays diplomatic games like the devil would. My own suspicion is that China has put a gun to his head.